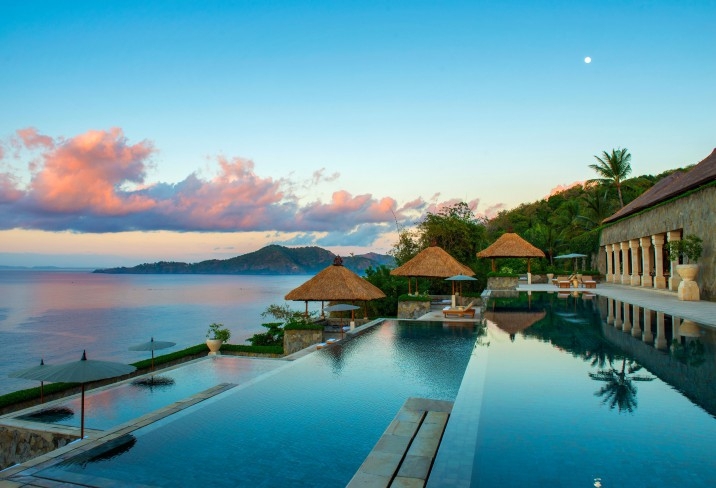 Amankila, or 'Peaceful hill' is a luxury coastal retreat of just 34 villas set on the green hill of Indrakila near Manggis. Architect Ed Tuttle was inspired by the nearby palaces of Ujung and Tirtagangga, now lovingly restored after volcano damage. The 34 suites are fashioned as beach houses linked by walkways. Each thatch-roofed suite has individual private terraces with sun beds and uninterrupted views across the Lombok Strait. In fashion with the area's royal past, there are several choices in suites, including the Indrakila Suite, named after the hill upon which the hotel is built and includes a private pool; and the larger Amankila Suite which enjoys a private butler service. Some of the luxury furnishing includes locally made coconut shell tables and rattan chairs. Mount Agung, the tallest volcano on Bali (3142m) looms like a giant overlooking the resort, revered by the local people. Visit the coastal towns of Manggis, Candi Dasa, Tenganan and smaller villages in the area. Go and marvel at the dedication of the staff who restored the beautiful Water Palace of Tirta Gangga, as well as other historical and cultural attractions in this eastern Regency of Karangasem, or ask to join one of the diving expeditions on the wreck of the SS Liberty, with it amazing coral and marine life.